Danny McCaslin Wins Red Putter Pro Tournament in Sudden Death! 1 August 2015 - Ephraim, Wisconsin -Congratulations to the 2015 Red Putter Pro Champion Daniel McCaslin! 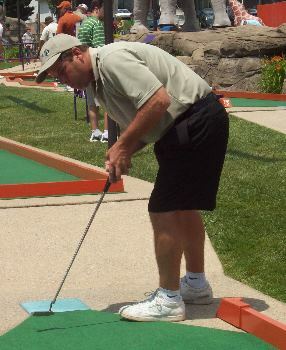 Daniel McCaslin of Holly Springs, NC, took first place in the Red Putter Pro Tournament held Saturday, August 1st at The Red Putter Mini Golf in Ephraim. After 3 rounds of golf, Daniel McCaslin and Nathan Gomoll were tied with a score of 104. McCaslin won a tie breaker by getting a hole-in-one on hole #7, The Bear, to take first place, with a cash prize of $2000, Trophy and the Red Jacket. Eric Kraft of Milwaukee, placed third with a three round score of 105. McCaslin also took home the trophy for Best Single Game with a score of 32 in the second round. Daniel McCaslin was also a Champion at the 2010 Red Putter Pro Tournament. A total of 71 golfers played three rounds of golf. Players had to qualify for the tournament by scoring less than par on the course.